In this episode of the 5 Leadership Questions podcast Todd Adkins and Barnabas Piper are joined by Daniel Im to talk about how to use the popular and helpful Strengths Finder assesment that was developed by Gallup. It has come up on the podcast many times, so now they dig into how it works and how it should (and should not) be used by organizations and individuals. 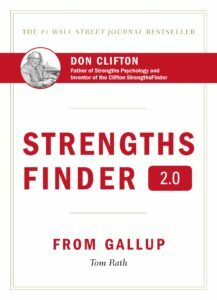 In brief, what is Strengths Finder? How do you use this for putting together and leading a team? How can people use Strengths finder for personal or professional growth? What do these tell you about the kind of job to look for or how you fit in a team? “The best of the best found a way to manage their weaknesses instead of focusing all their strength on it.